Black rice is also known as 'forbidden rice' because for centuries it was reserved for the elite Chinese and forbidden to commoners. Crops were planted in small amounts and closely monitored. It was renowned as being good for the kidneys, stomach, and liver. Today black rice is available to everyone, and still has a great reputation in health benefits. It is high in iron, and of all the rice varieties, it has the highest amounts of disease-fighting anti-oxidants, proteins, and dietary fibre. 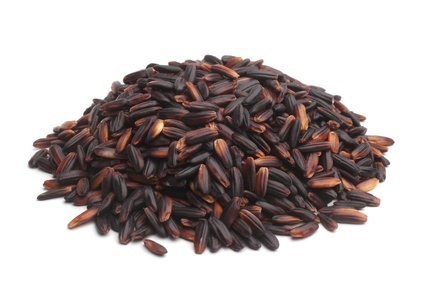 Black rice has a dark purple to black colour which turns deep purple when cooked. The cooking water will also turn purple during cooking. The taste is mild and nutty, similar to brown rice. As with all unrefined grains, it takes longer to cook than the white variety. If you soak it for at least an hour beforehand, cook time is reduced to 30 min. Pre-soaking also makes nutrients more available. If you do not soak it, allow 50 - 60 min cooking time.